Harvard University called the organization challenging its race-conscious admissions process a “wolf” eager to turn back the clock on racial diversity, on the final day of a three-week trial that could upend the use of affirmative action on college campuses. 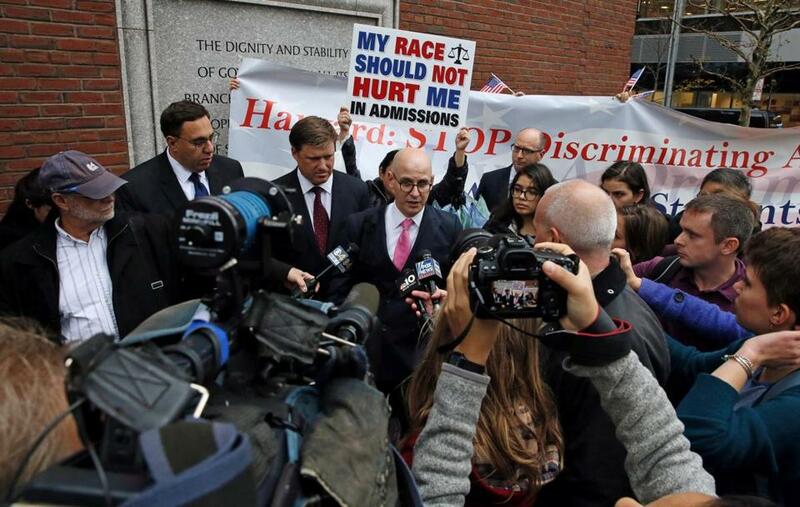 “The wolf of racial bias is indeed at our door; we ask the court to turn the wolf out,” said William Lee, an attorney for Harvard in his closing statement Friday. Students for Fair Admissions, which sued Harvard alleging that the college discriminates against Asian-American applicants, is aiming for a campus where black and Hispanic students are markedly reduced, Lee said. 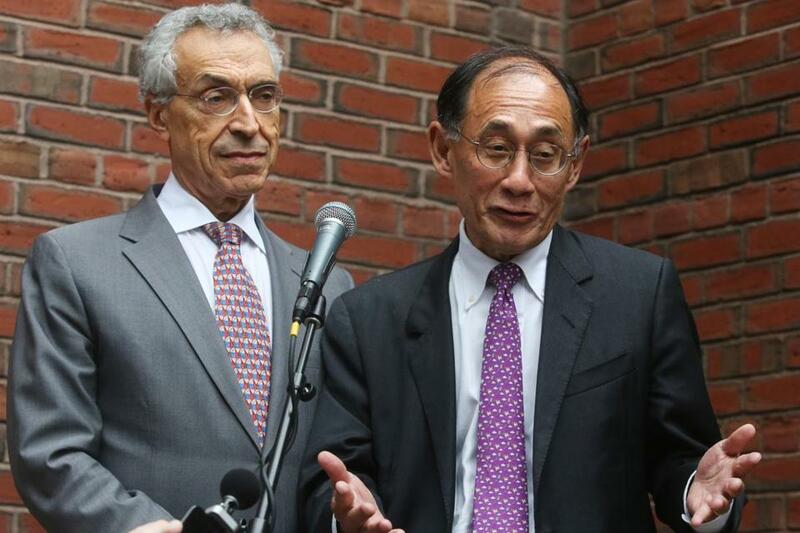 Harvard attorneys Seth Waxman (left) and William Lee called the organization challenging the university’s race-conscious admissions process a “wolf” eager to turn back the clock on racial diversity. The case is about Harvard’s treatment of Asian-American applicants and whether the university’s admissions officers are biased against them, said Adam Mortara, an attorney for Students for Fair Admissions. Mortara objected to being portrayed as racially biased and defended Edward Blum, the founder of Students for Fair Admissions and the architect of the lawsuit and a previous legal challenge to affirmative action in higher education. Adam Mortara (center), an attorney for Students for Fair Admissions, objected to being portrayed as racially biased and defended Edward Blum, the founder of Students for Fair Admissions. It will likely be months before Judge Allison Burroughs issues a ruling. Both sides have indicated they will appeal if they lose and are keeping their eye on the Supreme Court, where many legal experts expect the case will ultimately be decided. The case has drawn widespread attention over the past few weeks. Law students from local colleges and Asian-American families from Lexington dropped into the courtroom to observe the proceedings. Chinese media covered the case, and an attorney from the US Justice Department Office of Civil Rights, which is investigating both Harvard and Yale University over Asian-American discrimination, attended the trial every day. Internal documents, e-mails, and data presented during the trial shed light on Harvard’s usually secretive admissions process, revealing how money, family connections, race, and personality influence how the country’s oldest and most prestigious university chooses about 2,000 students from an applicant pool of over 40,000 annually. But ultimately the case will rest heavily on the data, resulting in several days of testimony that resembled a college-level lecture on statistical analysis, with discussions about coefficients, regression models, and observed and unobserved variables. Jia Wu joined protesters during a press conference held by Harvard attorneys following closing arguments in the Harvard admissions trial Friday. Students for Fair Admissions argues that its analysis of six years of Harvard’s admissions data shows that the college’s use of personal ratings, which measure likability, leadership, and vivaciousness, discriminates against Asian-American applicants. Getting a high personal rating is crucial to gaining entry to Harvard where so many of the applicants are academically strong and active in sports and clubs. According to Students for Fair Admissions, only 22 percent of Asian-American applicants in the top 10th of the academic ladder received high personal ratings, compared to about 30 percent of white applicants. Harvard’s top black and Hispanic applicants were even more likely to get high personal ratings. 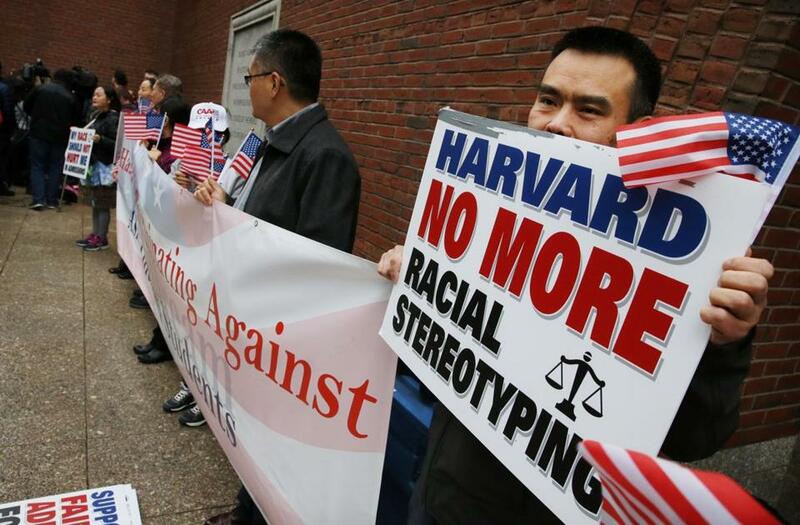 The organization pointed out that an internal analysis done by Harvard’s staff before the lawsuit was filed also raised questions about whether Asian-Americans were disadvantaged. “Bias has crept into, leaked into the system,” said John Hughes, an attorney for Students for Fair Admissions, in his closing statement. If the personal score is influenced by race, the models indicated that Asian-Americans face a penalty and “the statistical case is over,” Hughes said. But Harvard accused Students for Fair Admissions of data-mining and leaving out key aspects of the admissions process in its analysis. Harvard has said admissions officers consider more than 200 variables in evaluating students, from grades and whether their parents attended Harvard, to race and where they live. Students for Fair Admissions, for example, did not include parental occupation or what the student intended to study, Harvard argued. 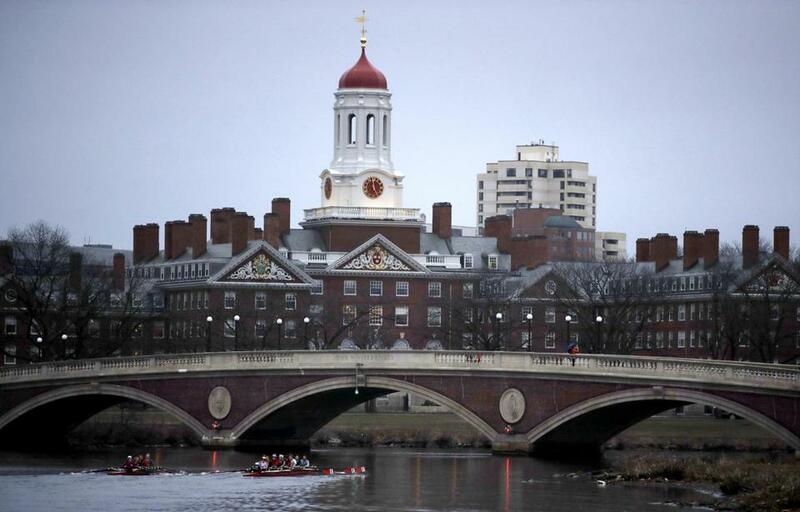 Harvard said its own analysis found no racial bias and that despite low personal scores, Asian-Americans who were children of alumni or donors were more likely than white students to get into the college. Harvard questioned how admissions officers could discriminate against Asian-American in one pool and give them an advantage in another situation. “How do you implicitly discriminate for someone and implicitly discriminate against someone?” Lee asked, calling the allegations full of inconsistencies. None of the 20,000 members of Students for Fair Admissions testified during the trial. The Asian-American students who were denied admissions to Harvard in the complaint remained anonymous, and Students for Fair Admissions did not submit their admissions files into evidence. Several current and former Harvard minority students testified over the three weeks, in defense of affirmative action and to the benefits of diversity. On Friday, Burroughs acknowledged the historic nature of the case and said she was aware that her decision will likely have a significant impact on the lives of American college students. “I take the charge seriously,” Burroughs said.